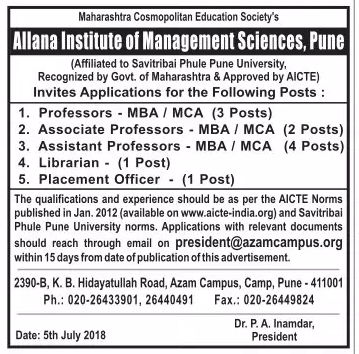 Allana Institute of Management Sciences, Pune has advertised in Loksatta newspaper for the recruitment of Professor/Associate Professor/Assistant Professor jobs vacancies. Interested and eligible job aspirants are requested to apply within 15 days. Check out further more details below. About College: Allana Institute of Management Sciences has been an existence since 1998. The institute offers 2-years full time MBA and 3 years full time MCA courses, affiliated to the Savitribai Phule Pune University and approved by A.I.C.T.E., New Delhi. The MBA Course has been accredited from 6th Aug 2013 to 5th Aug 2016 by the National Board of Accreditation (NBA), New Delhi for 3 years w.e.f. 6th August, 2013.